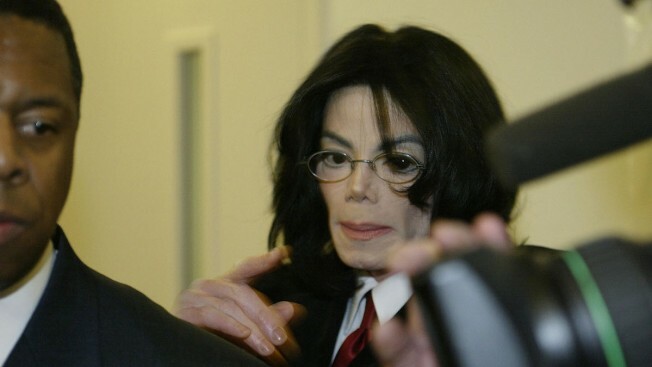 Pop star Michael Jackson and his bodyguard cover the lens of a camera to avoid being filmed as he enters the Santa Maria Courthouse April 30, 2004 in Santa Maria, California. Less than a month after "Leaving Neverland" premiered at the 2019 Sundance Film Festival, HBO has released a brand-new trailer of the Michael Jackson documentary. In the sneak peek released Tuesday, choreographer Wade Robson and computer programmer James Safechuck are prepared to share their experiences of visiting Neverland Ranch. "I was seven years old. Michael asked, 'Do you and the family want to come to Neverland?'" Wade recalled in the trailer. "The days were filled with magical childhood adventure experiences. Playing tag, watching movies, eating junk food: Anything you could ever want as a child." But despite the amusement park rides, animals and other attractions, the two men will tell the story of how they were allegedly sexually abused by the King of Pop--a claim Michael's estate denounces. "This is yet another lurid production in an outrageous and pathetic attempt to exploit and cash in on Michael Jackson," the estate said in a statement to E! News. "Wade Robson and James Safechuck have both testified under oath that Michael never did anything inappropriate toward them. Safechuck and Robson, the latter a self-proclaimed 'master of deception', filed lawsuits against Michael's Estate, asking for millions of dollars. Both lawsuits were dismissed." The statement continued, "This so called 'documentary' is just another rehash of dated and discredited allegations. It's baffling why any credible filmmaker would involve himself with this project." According to HBO, the documentary "crafts a portrait of sustained abuse, exploring the complicated feelings that led both men to confront their experiences after both had a young son of his own." "He told me if they ever found out what we were doing, he and I would go to jail for the rest of our lives," Wade alleges in the trailer. "I want to be able to speak the truth as loud as I had to speak the lie for so long." "Leaving Neverland," directed by Dan Reed, premieres March 3 and 4 on HBO.